Did you know that your personal skin care regime is extremely important for healthy, radiant skin? Some friends and family members may have quite the extensive skin care regime and you may wonder if you’re falling flat. 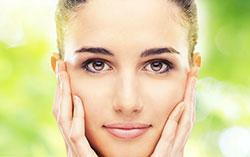 Having a good skin care regime that fits your skin’s unique needs is important for preventing a host of problems in the future. From the office of your Tulsa dermatologist Dr. Lynn Anderson, find out how to maintain healthy skin. Smoking has so many negative effects on your health in general, and it can cause issues for your skin, as well. Smoking actually narrows the blood vessels to reduce the amount of blood flow to your skin. This prevents oxygen and important nutrients from getting to the skin. Over time, this can prematurely age you. Plus, smoking also damages both elastin and collagen, which helps to keep your skin more elastic and youthful. If you are a smoker the best thing you can do for your skin is quit now. One of the best things you can do for your skin is protect it from the harmful rays of the sun. Besides avoiding the sun between 10 a.m. and 4 p.m. when UVA and UVB rays are their strongest, you should also wear protective, tightly woven clothing that covers your skin and apply sunscreen with at least an SPF of 15 about thirty minutes before going out in the sun. You should also remember to reapply sunscreen after sweating or swimming. Not sure which kind of sunscreen is right for you? Your skin doctor in Tulsa would be happy to make some recommendations. Protecting against the sun can prevent age spots, wrinkles and skin cancer. Do not bath in hot water, which can strip skin of necessary oils and cause dryness. Also, limit how much time you spend in the shower or bath. Stay away from harsh soaps that can also cause dryness. After showering, remember to pat your skin dry and never rub. Apply a moisturizer to your skin every day. These are only some helpful tips that will go a long way to keeping your skin looking its best. If you are dealing with any skin issues or have questions, don’t hesitate to contact our Tulsa, OK dermatological office. Midtown Dermatology offers a full range of dermatological services to meet all your needs.